This figure became available as a send away on The Empire Strikes Back 48 back card, but made its first carded appearance on the Return Of The Jedi 66 back card. Interestingly, The offer on The Empire Strikes Back 48 back card was printed during the period where the sixth episode had another name, therefore the original offer read "Free! Revenge Of The Jedi". Comments: In 1982, to many young Star Wars Afficionados, the vintage Admiral Ackbar action figure was the first glimpse at what the final film had in store for them. The card backs offering the Mon Calamari in exchange of a few small proof of purchases and a couple of dollars, also brought what everyone thought would be the title to the last chapter of the Star Wars Saga, until the bearded dude who made it all up changed his mind. So as a Jedi's 'Revenge' became his 'Return', the good Admiral lead us all into the final battle of good vs. evil. Major Variations: Though all vintage figures have minor variations, the Admiral Ackbar figure did have one major variation worthy of mentioning. 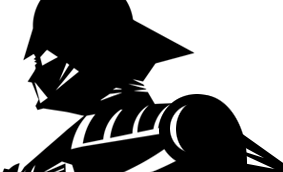 There are two distinctly different Mould variations, and hence spray op variations. The first version had arms moulded in white plastic with red spray ops and its torso was moulded in tan plastic (the bib colour) with white and yellow spray ops. The second version, thus far appearing only on Admiral Ackbar figures produced in Taiwan, has arms moulded in red plastic with white spray ops and its torso was moulded in white plastic with light olive (bib colour) and yellow spray ops. In theory, these mould/ spray op variations could exist mixed on some figures (red arms with tan torso, white arms on white torso) including mixed arm variations. To date, however, no such examples have ever appeared. 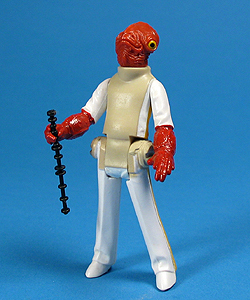 Even though one may have been more readily available on a regional scale, the Red Arms version of the Admiral Ackbar action figure is considered rarer than the White Arms version.